A beautiful sunny day with a light easterly wind was a good way to start Mothering Sunday and, after Saturday’s build up of birds (no new species for the year, but increased counts included 80 Robin, 34 Dunnock and 19 Chiffchaff), hopes were high for more. The arrival of Robins has been widespread across the island. 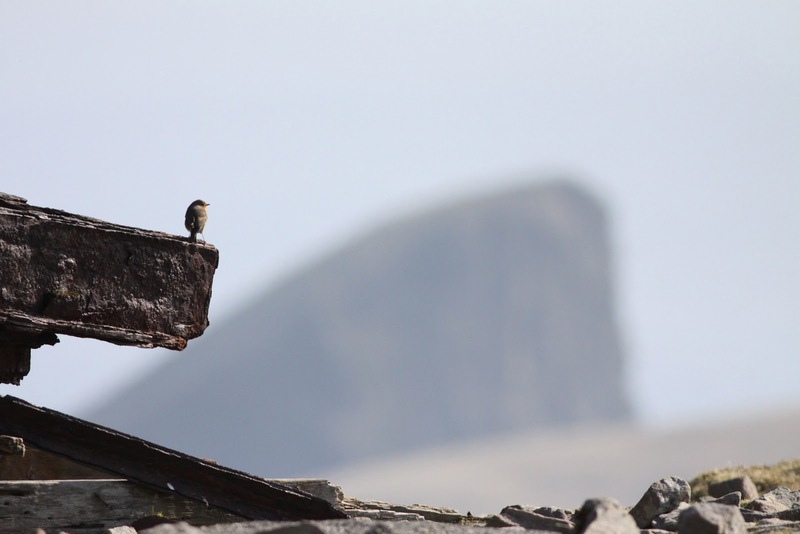 This one on Ward Hill surveys Fair Isle, with Sheep Rock looming in the background. Early traps suggested there were possibly a few more Robins about and things got better when a Grey Wagtail (the first of the year) was seen in the Gully. As the AWs made their way south, it became clear there were indeed more Robins, quite a few more in fact. 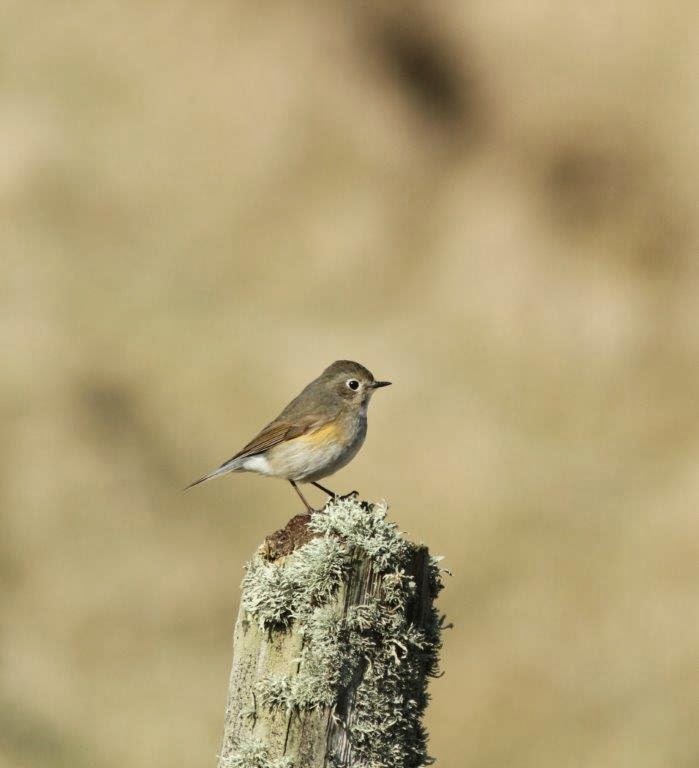 It was whilst picking through some of these that Ciaran got his Fair Isle career (which is a mere five days old) off to the sort of start that people dream of when coming to work here, by picking out a Red-flanked Bluetail on a fence at the top of Klingers Geo. It went on to show well to a small crowd (a few of whom were diverted from their journey to Chapel by the news breaking just before 11am!) who were able to sit in the sunshine and enjoy the spectacle. Nice one Ciaran. This is the view that greeted our new AW on his first solo SE census (photo Ciaran Hatsell). 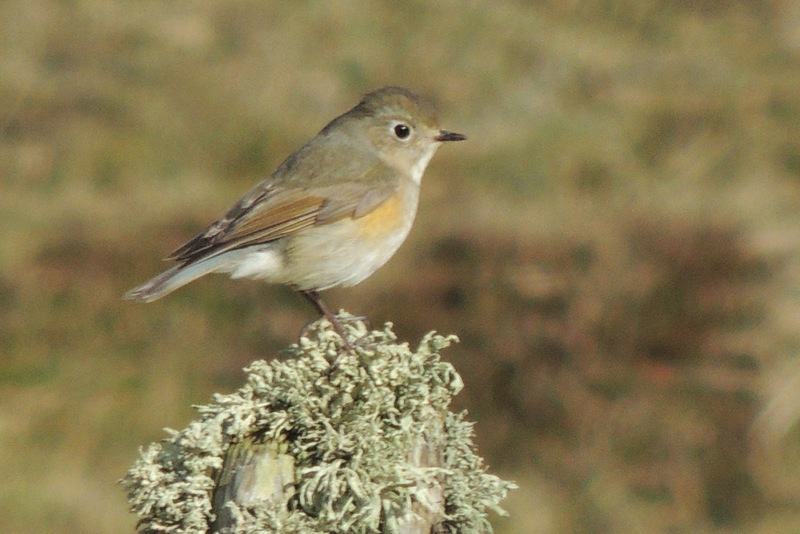 The 10th Fair Isle Red-flanked Bluetail, but the first spring record. 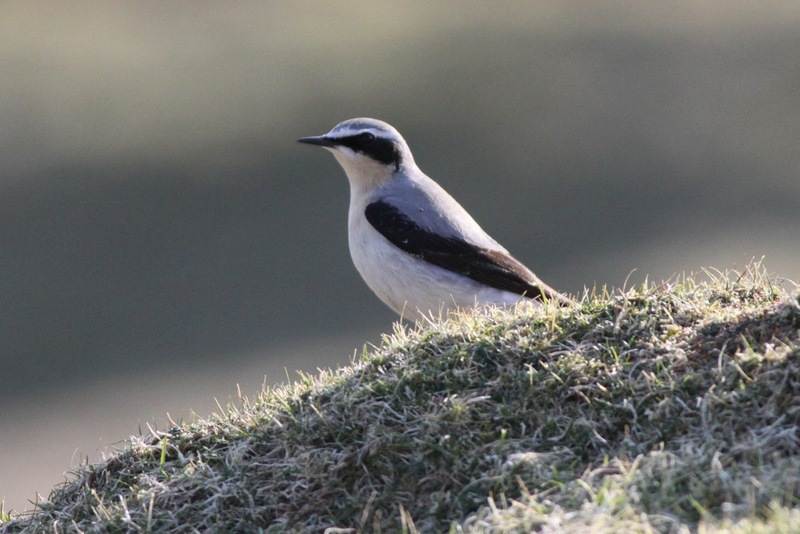 A quick scan of records suggests that this may be the earliest British record, apart from the wintering bird this year of course (photo Deryk Shaw). After records in 1981, 1984, 1993, 2003, 2004, 2008 and 2010 (3), it appears that the Tarsiger is now becoming a more regular visitor, but one that hasn't lost any of its appeal (photo Deryk Shaw). Although the Bluetail was the undoubted highlight, the supporting cast made for a fantastic day’s birding. A Hawfinch at Schoolton late in the day was also good, whilst other additions to the year list were Greenfinch (a female trapped in the Plantation), Short-eared Owl (over Burkle), Carrion Crow (on Lerness) and Ring Ouzel (a male at North Naaversgill). The Robin count increased to an impressive 145, with the geos and crofts also being littered with Dunnocks (39), Chiffchaff (34), Song Thrush (30), Blackbird (15) and also decent counts of Mistle Thrush (14), Wheatear (20), Woodpigeon (17) and Snipe (61). 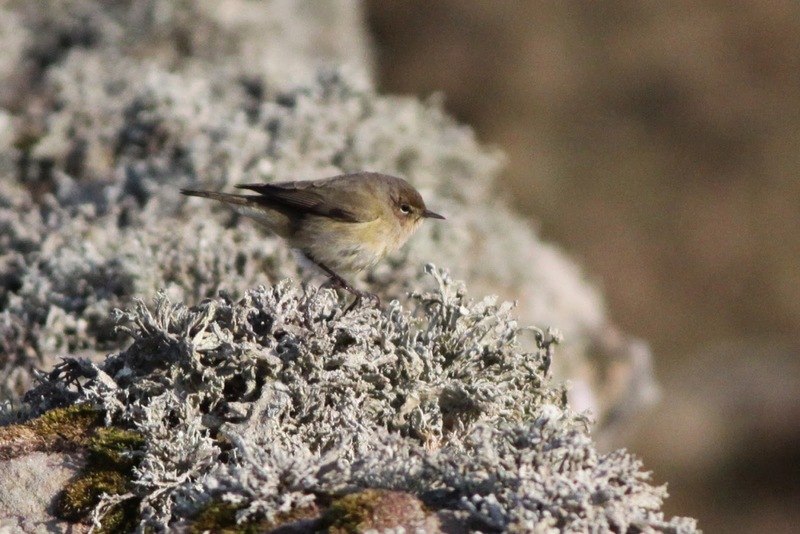 Chiffchaff on the Hill Dyke. It appeared that there may have been more migrants arriving later in the day, so tomorrow could be another interesting day. Amongst the other sightings of note, the Black Redstart count increased to 3, there were 2 Siskin, 14 Snow Bunting, Jack Snipe, Moorhen, 2 Cormorant, Grey Heron and 2 Iceland Gull. 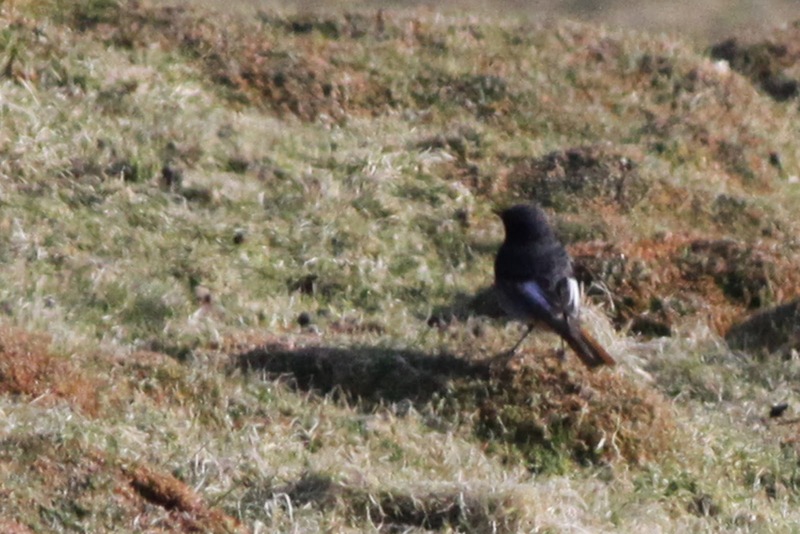 A distant male Black Redstart near Gunnawark. A few people have commented on my prediction last Sunday that there would be ‘a Bluetail amongst a few Robins, thrushes etc sometime next week’; I’m going to try to predict a win for Sunderland at home to West Ham tonight in the hope that I can take advantage of my run of form (although it has also been pointed out that after predicting about 900 birds so far during my time on Fair Isle, I was bound to get one right by chance eventually). Who knows what tomorrow will bring, but it looks like at least a week of easterly winds still, so there’s every chance of another big spring rarity, or at least a few more good birds for the year. Today will take some beating though! Having numbers of common migrants around has, combined with the weather, really set the spirits at a high level for the start of the season and at times it was hard to remember that we're still in March!